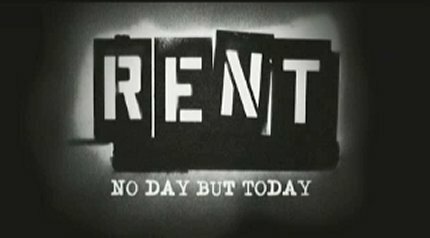 If the first teaser trailer for Rent was a bit too unusually music video-like to effectively sell the film to a mass audience unfamiliar with the original stage production, then the second trailer tilts the balance a bit too far toward a conventional direction. Although Chris Columbus's name is nowhere mentioned in text or voice, this rather routine spot, which incorporates spoken dialogue with Jonathan Larson's music, paints the material as being as tritely mawkish as one would usually expect from the director. From the "Eight friends... one extraordinary year" text line to the highlighted spoken line delivered by Idina Menzel (as Maureen Johnson)--"You always said how lucky you were that we were all friends. But it was us, baby, who were the lucky ones"--the trailer sidesteps the material's darker and grittier elements in favor of a sunnier, sappier direction. Perhaps that perception is more mainstream palatable and hence commercial, but then it also means suppressing the show's edgy cool. That said, there are some good points this trailer. The opening line, delivered by character of Mark Cohen (Anthony Rapp)--"There are times when we are dirt broke, hungry, and freezing, and I ask myself, 'Why am I still living here?'" --does vividly allude to the key themes of poverty and alienation before the onslaught of sentimentality kicks in. Perhaps most notable of all is how the trailer, unlike those for recent movie musicals Moulin Rouge! and Chicago, does not hide the fact that the film is, indeed, a musical, with it having Movie Trailer Announcer Guy explicitly calling the film "a musical phenomenon" and heavily incorporating shots of the main cast singing the song "Finale B." The song itself, which plays throughout the trailer, is a rather smart choice as it is in fact an amalgam of three central songs from the show ("Another Day," "Will I?" and "Without You") as well as features the signature "no day but today" line/theme. Personally, what singlehandedly makes the trailer effective--and amps my own anticipation of the film--is the shot of Rosario Dawson's Mimi straddling the railing of a fire escape in an obvious excerpt from the character's trademark tune "Out Tonight." The shot more or less reflects what all fans of the stage show have envisioned a film translation of the number to look like, and if the rest of the film follows suit, then Columbus looks to have done right by the original show's fans at least.